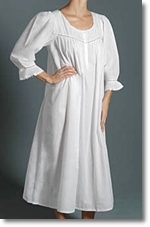 For hundreds of years cotton nightgowns, also known as nighties, have been worn as bedtime attire. The nightgown’s popularity still flourishes in today’s society as one of the most comfortable and cosy options for women (and some men) alike. Available in a multitude of styles, cotton nighties come in different colors, sleeve lengths, and thicknesses (heavier is a favorite for those of us who live in cooler climates, and vice versa). And, there are different lengths. Lightweight, short nightgowns tend to be more popular during the hot summer months, and heavier long nightgowns are a must-have for those long and cold winter months. If, you prefer shopping in person, the best place to start your search is at your favorite lingerie store or in the lingerie section of a department store. You can also find a variety of night gowns online by typing in relevant keywords, such as “nightgown,” into a trusted search engine. Searching online should give you a good idea on where to start looking for that perfect nightie. Since finding one online does not give you the opportunity to try it on before buying, it may be a good idea to see if the item that catches your eye is available at a local store first. If you are in the market for a vintage nightgown you may want to check out any thrift stores or garage sales in your area. You can also try finding vintage cotton nightgowns online at marketplaces like eBay.com (see below) or Etsy.com. Lingerie Tip – Did you know that cotton is a natural fiber with breathability? This makes it a great option for anyone with sensitive skin. One of the most important things in choosing a cotton nightgown is to make sure that its material is a quality you find acceptable. Cotton is one of the best fabrics for nightgowns and sleepwear because it is light, airy, and most important, breathable. Some nightgowns may not be 100% cotton so make sure to check the label. The feel of cotton fabric also varies from style to style because cotton is processed differently in different places. So, keep this in mind when choosing. During the Victorian era cotton nightgowns were typically white in color. They were characterized by flowing material, long puffy sleeves, and below-the-knee length. Lace, ruffles, or ribbon would adorn the collars. Similar options still exist on the market today. However, there is now a much wider variety available for you to choose from. There are also skimpy styles, and options that offer more coverage. Find the style and color that suit you best. Your key concern should be comfort, especially if you want to sleep well. Depending on what you are looking for, think about whether you want to buy a vintage nightgown or a brand new, never-worn nightgown. If you love the look of vintage lingerie, but you're not particularly sweet on the idea of wearing what essentially are second hand nightgowns, you can also check out vintage-inspired pieces. Price may or may not be a factor, depending on how you are faring in this economy. Fortunately there is something for everyone. Prices of nightgowns vary between brands, styles and of course quality. Lingerie brands such as Hanro and La Perla are well known for their better quality and tend to be at the high end range. Whereas, Thea, Eileen West and Aria offer quality at mid range prices. Last but not least, consider the fit. A nightgown needs to fit well. And, it's best to try on any nightgown before you buy it. If, you decide to purchase online and it doesn't fit, make sure you can return and / or exchange it for a better size. Shopping online for cotton nightgowns, Victorian nightgowns, your favorite night gowns and ladies sleepwear is easy on eBay clothing. From cosy cotton flannel nightgowns and elegant victorian nightgowns to popular Miss Elaine nightgowns , the selection of nightgowns sleepwear and intimate apparel has never been better or more affordable. All of the womens sleepwear that you see listed below is currently available on eBay.com - so if you see something you like, hurry and place your bid. When you click on a link a new window will open and you'll see a sampling of the intimate apparel and lingerie for sale on eBay.